Thanks to Dr. Zlatko Marusic, Sestre Milosrdnice Clinical Hospital (Croatia), for contributing this case. To contribute a Case of the Week, follow the guidelines on our Case of the Week page. (1) We have updated the Molecular Pathology chapter with a section on DNA sequencing written by Rodney E. Shackelford, D.O., Ph.D., Tulane University, Louisiana. (2) We have extensively updated the CD Markers CD1-CD49 chapter, which now has 68 topics, 479 images and 1092 references. (3) For a "printer friendly page" of any part of our website, we recommend visiting http://www.printfriendly.com, which has options to print with or without images. As this works better than our "printer friendly" versions of chapters, we will remove the printer friendly versions as we update chapters. A 55 year old woman presented with hematuria. A bladder biopsy was obtained. There is a characteristic downward proliferation of urothelial nests with focal squamous metaplasia but without atypia. The nests wrap around vessels with fibrin deposition and congestion. 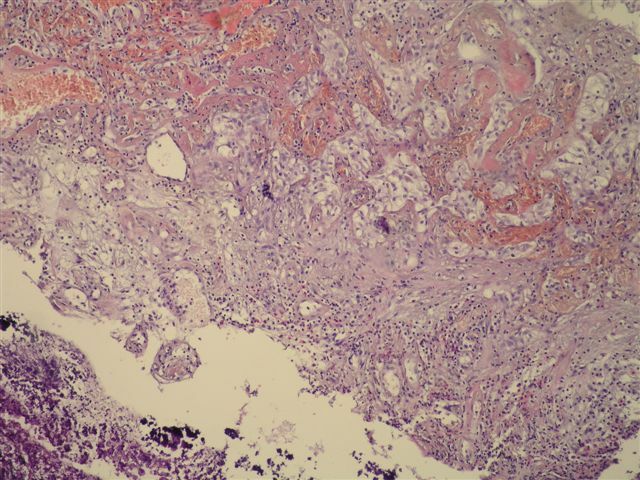 One of the photomicrographs shows calcifications next to the biopsy fragment. In 2000, Baker and Young reported 4 cases of radiation cystitis with pseudocarcinomatous proliferations, which were often confused with invasive carcinoma (Hum Pathol 2000;31:678). Two subsequent case series describe this entity. The first series, by Chan and Epstein (Am J Surg Pathol 2004;28:909), reported on 20 patients with similar biopsy features and a history of pelvic irradiation or systemic chemotherapy. The second case series, by Lane and Epstein (Am J Surg Pathol 2008;32:92), described 8 patients with ischemia or chronic irritation, but no history of irradiation. 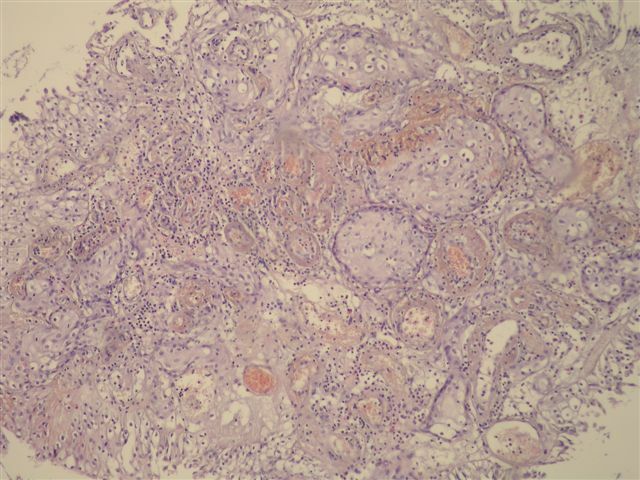 Pseudocarcinomatous epithelial hyperplasia of the urinary bladder has also been described in reviews of pseudoneoplastic or therapy-induced lesions of the urinary bladder (Mod Pathol 2009;22:S37, Open Pathol J 2009;3:74). 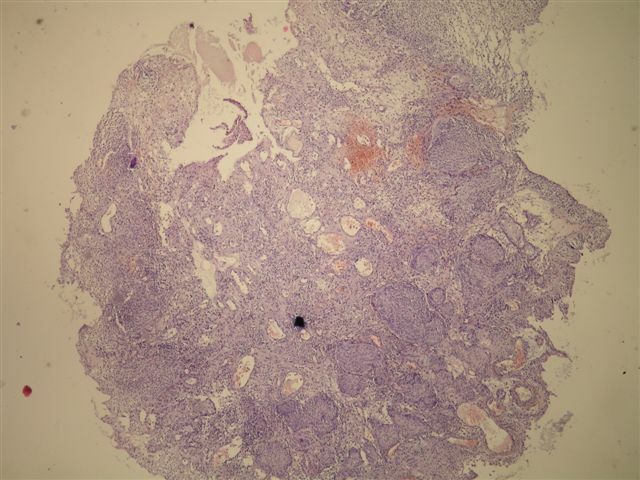 In the present case, a pathologist search for prior biopsies revealed a history of radation therapy for uterine cancer three years previous. 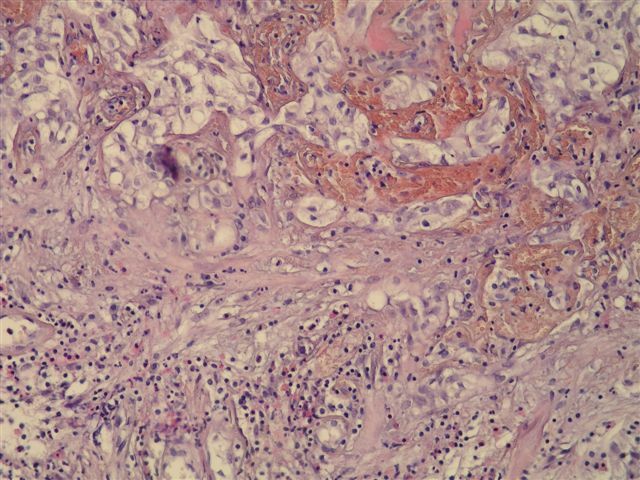 Despite the pseudoinvasive nests, these lesions have characteristic findings that differentiate these cases from invasive carcinoma. Most cases show no mitotic figures, but there is frequently hemorrhage, thickened vessels and other radiation associated vascular changes. Other features include fibrin deposition, fibrin thrombi, fibrosis, inflammation, hemosiderin, ulceration, edema and vascular congestion. No treatment is required for this reactive condition.